We are now taking bookings for 2019. Contact Us Now To Book Your Summer Tour! Welcome to C.C.Des Ormes website. Our home page should tell you everything you need to know about us and what we can offer visiting teams. If you need any more information, don't hesitate to contact us. Take a look at our sponsors page to see who else is supporting cricket in France. Take a look at the 'Sponsors Page' to see what we can offer you. One of the most beautiful cricket settings in the world? 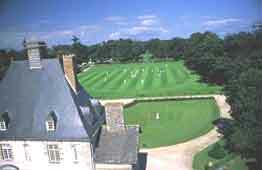 Formed in 1996, CC Des Ormes have been playing cricket in Brittany and hosting cricket clubs, golf societies, stag weekends and many others at our fantastic Chateau Des Ormes ground ever since. With the Chateau behind the bowlers arm at one end, the duck and fishing lake at the other and woodland either side, the setting couldn't be better. We play on an artificial wicket, which means our season runs from late March right through to early October with at least 2 games each weekend. Have a look through the site and see what we and the area can offer you. Cricket in France is certainly not like French cricket, and cricket in Brittany may just be the tour you're looking for. Chateau Des Ormes is one of the largest holiday facilities in France with a campsite set in mature woodland, 4 swimming pools including a large leisure pool, tennis courts, equestrian centre, several bars and a nightclub. As well as all this, there is the fantastic 18 hole woodland golf course, 9 hole par 3 course, driving range, club house and the 3 star hotel, which provides the accommodation for the touring teams. All of this and more is available to touring teams to take advantage of so, why not come along and play the longest established cricket team in Brittany. The 18 hole on-site course offers challenges to golfers of all abilities. The beautiful woodland setting is complemented by plenty of water to worry about! The picture to the right shows the veiw of the Chateau from the 18th green. Residents of the hotel benefit from discounts on green fees. Please note that the course is used for competitions. If you are interested in playing whilst you are with us, ask about availability at the time of booking. There are plenty of other good courses in the area so, if there is a competition, we should be able to arrange golf for you locally. Coming over to us couldn't be easier. We are just 20 minutes from the port of St. Malo, 2 hours from the ports of Caen or Cherbourg, 3 hours from Roscoff or Le Havre & 4 hours from Dieppe. All have direct sailings from Portsmouth, Poole, Plymouth & Newhaven with Brittany Ferries or LD Lines/Transmanche Ferries. Alternatively, you can fly out with Ryan Air from Stansted or Flybe from Southampton. You can fly to Dinard with Ryan Air, which is only 40 minutes away or Rennes with Flybe which is about an hour from us. Cricket Club Des Ormes - Guinness World Record Holders....Really? Over the weekend of the 21st and 22nd June 2003, CC Des Ormes set the World Record for the longest continuous game of cricket, starting at 3pm on Saturday 21st and finishing at 5.15pm on Sunday 22nd. The record was set at 26 hours and 15 minutes. The game, played between two teams of players and friends of CC Des Ormes was not only fantastic fun, but also raised money for two good causes: the French national cancer charity (La Ligue Contre Le Cancer) and for one of our players, who was diagnosed with testicular cancer at the end of the 2002 season. If this is too incredible to believe, a cricket team in France holding a cricketing World Record, take a look at the 2005 & 2007 edition of The Guinness Book of World Records!! Click here now for booking information!